• Editor’s note: We updated this article at 45 hashtags for social change. Sending a tweet into the Twitterverse without a proper tag is like stocking a library with no regard to author or subject matter. Your messages may go unread and opportunities to connect with others may be missed. Make room for a hashtag in your post — that will add your tweet to an existing (if somewhat hidden) thread, given that Twitter now turns hashtags into links. Bottom line: When used judiciously, hashtags are definitely worth the precious extra characters. Last year we wrote about how nonprofits can use Twitter hashtags. But hashtags have evolved a bit since then. You may want to download and print out our new 40 hashtags for social good flyer so that you always have the right tag ready for your tweets. A hashtag is a community-driven convention for adding additional context and metadata to your tweets. Similar to tags on Flickr, you add them in-line to your Twitter posts by prefixing a word with a hash symbol (or # sign). Hashtags are useful when discussing a specific topic, trying to reach a certain demographic, aggregating tweets about an event or trying to raise awareness of a cause. Twitter now creates a link whenever anyone adds a hashtag — click it (say, #cause) and you’ll see a thread of most recent tweets that contain the same tag. Anyone can create a hashtag. Just affix the # symbol to the beginning of a word, tweet it — and you’ve got your #hashtag! A hashtag can be included anywhere in your tweet — in the middle or at the end. It doesn’t matter if the hashtag is uppercase or lowercase. How to choose the right tag? Start with our flyer, then visit to search.twitter.com, type in the hashtag and see how other people are using it. You can also go one step further and search the hashtag on an analytics website, like Trendistic, What The Hashtag or hashtags.org, to see how it’s trending over time. This will clue you into which hashtags are most popular (#nonprofit was used an average of 384 times per day last week) and which hashtags you should avoid because they see more action than the freeway at rush hour. With an average of 500 #green tweets a day, it could be difficult to separate yours from the masses. Can’t find the right hashtag for your tweet? Create your own. Just remember to keep it short and recognizable so others will use and search it. The longer your hashtag is (say, more than 10 characters), the less likely other people will be to retweet it. 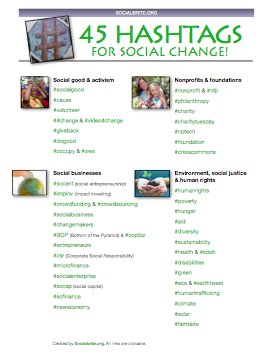 Before you create your own, check out these existing hashtags for social good and start a conversation. Have your own favorite, or spot something we missed? Please add in the comments below! 1. #socialgood: This hashtag can be used to discuss any topic related to social good. 2. #cause or #causes can be used to discuss subjects related to social causes. 3. #volunteer: Use this when talking about or looking for a volunteer opportunity (it sees more traffic than #volunteers or #volunteering). 4. #4change: This hashtag was created to flag a monthly chat on how social media is helping to foster change. 5. #giveback: Use this hashtag to talk about giving back to the world and your community. 6. #dogood: Support the Do Good Movement and share your good deeds with the world. 7. #crisiscommons: This hashtag is used largely during disasters to create crowdsourced solutions that contribute to disaster relief. 8. #nonprofit: This versatile tag can be applied to any tweet concerning the nonprofit sector (and is much more popular than #nonprofits). 9. #philanthropy: Tag your philanthropic news with this hashtag. 10. #charity: Mark your charitable tweets with this hashtag. 11. #charitytuesday: Share your favorite nonprofits with your followers every Tuesday. 12. #nptech: Use this for tagging nonprofits’ use of technology. 13. #foundation: Use when discussing news about foundations (it’s much more popular than #foundations). 14. #grant: Use this tag to reference all things grant related. 16. #socialbusiness: Use this to refer to business working toward social good. 17. #changemakers: Use this when discussing change through social entrepreneurship or when referring to Ashoka Changemakers. 18. #socialadvertising: Use this to discuss advertising as a form of activism. 19. #BOP (Bottom of the Period Pyramid): A favorite among entrepreneurs, this can be applied to a variety of tweets from topics concerning frugal spending to untapped resources. Be aware, however, that this hashtag gets a lot of use by those outside of the nonrofit sector. The related #bopbiz might be a better choice. 20. #entrepreneurs: Great for connecting with talented entrepreneurs. 21. #csr (Corporate Social Responsibility): Use this for tweets about sustainability and holding corporations responsible. 22. #microfinance: Use this when discussing microfinance or extending financial services to the low-income sector. 23. #socialenterprise: Use this to discuss how business or organizations are using marketing strategies to achieve social good. 25. #sofinance: Use this for discussions on social entrepreneurship and finance. 26. #propoor: This hashtag references the debate about profits and the poor. 27. #neweconomy : Use this to discuss how technology and innovation are creating the opportunity for economic growth. 28. #humanrights: Use to discuss human rights or oppressive actions taken against individuals. 29. #poverty: Use this to start or join a discussion about poverty. 30. #hunger: Discuss subjects related to hunger. 31. #aid: Discuss financial or humanitarian aid. 32. #sustainability: Discuss topics related to sustainability. 33. #health: For use with tweets related to health. Another popular tag is #healthcare. 34. #green: This popular hashtag relates to the green movement and, more broadly, environmentalism. 35. #eco: This hashtag is focused on improving the environment (and, really, #environment is too long a hashtag, though it’s still popular). 36. #earthtweet: Share what you and others are doing to keep our planet healthy. 37. #humantrafficking: Use to discuss human trafficking and modern-day indentured servitude. 39. #solar: Discuss the benefits of, or questions about, solar power. 40. #fairtrade: Discuss subjects related to the fair trade movement. Kim Bale was recently the community outreach specialist for The Extraordinaries. Follow her on Twitter at @balekimb. #bop – isn't this 'bottom of the pyramid'? #neweconomy : My understanding is that Yes! Magazine set this up, and the feed is more about sharing ideas around the alternatives to a model based on economic growth. Hi Donnie, I've asked Kim about your suggested additions/edits (she's probably cross-eyed from all the hashtags she looked at!). Thanks for your thoughts, #bop is most definitely 'bottom of the pyramid', good eye on the typo! #neweconomy is definitely tied to Yes! Magazine as they've created the awesome New Economy list aggregating all of the tweets about sustainable and innovative ways to reshape our current economy – it's an interesting conversation, thanks for mentioning its origin. #nfp slipped under my radar, I'm glad you mentioned it. Seems to be a great source for focused non-profit news, though now that American football has started it seems the National Football Post is joining the conversation. Another great resource is Paper.Li that creates "twitter papers" from tweets around hash tags. The cool thing is that you can set it up to auto post to a twitter account every day. Thanks for this good and useful compilation. One that we @WITNESSorg and other video activists have been using, and would love to see on this list, is #video4change to feature successful and creative video advocacy examples. #video4change is a hashtag we @stories4good will support! Thanks Chris. Thanks for letting us know about #disabilities! Another one to keep in mind: #crowdfunding. – the latest buzzword for philanthropy and social enterprise. @RWJF_VP points to another hashtag: #sdoh, short for social determinants of health. I was hoping to find hashtags about dialogue, empowerment and negotiations that give voice and power to those with less. #mentoring would be a great addition to the list!